The purchase price is to be paid in all cash following the due diligence review and approval by the buyer. The seller is required to furnish a laundry list of due diligence materials to the buyer as itemized in the agreement. The agreement also contains a bill of sale and assignment for personal property in the facility conveyed with the real estate, a certificate of non foreign status (FIRPTA Affidavit) and a list of all service contracts for the property included as exhibits. 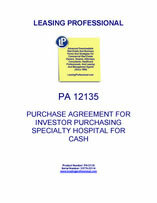 THIS AGREEMENT OF SALE AND PURCHASE (this "Agreement") is made and entered into by and between SPECIALTY HOSPITAL OWNER, L.L.C. , a __________ liability company ("Seller"), and SPECIALTY HOSPITAL PURCHASER, INC., a __________ corporation ("Purchaser"). Seller and Purchaser are sometimes collectively referred to herein as the "Parties". A. Seller is the owner of the Property (as hereinafter defined) which contains a specialty hospital commonly known as ____________. The Property is described in Exhibit A, attached hereto and incorporated herein by reference. "Existing Lease" shall mean the Existing Hospital Lease. "Fixtures" shall mean all permanently affixed equipment, machinery, fixtures, and other items of real property, including all components thereof, now and hereafter located in, on or used in connection with, and permanently affixed to or incorporated into the Improvements or on the Land, including, without limitation, all furnaces, boilers, heaters, electrical equipment, heating, plumbing, lighting, ventilating, refrigerating, incineration, air and water pollution control, waste disposal, air-cooling and air-conditioning systems and apparatus, sprinkler systems and fire and theft protection equipment, and built-in vacuum, cable transmission, oxygen and similar systems, all of which, to the greatest extent permitted by law, are hereby deemed by the parties hereto to constitute real estate, together with all replacements, modifications, alterations and additions thereto. Fixtures shall not include any trade fixtures owned or leased from third parties by Hospital Tenant. "Hospital" shall mean the approximately _________ square foot space that __________________occupies located on the Land. "Hospital Tenant" shall mean Hospital Tenant, LLC, a ________ limited liability company. "Improvements" shall mean the Hospital, together with all other improvements, structures and Fixtures located on the Land, including, without limitation, landscaping, parking lots and structures, roads, drainage facilities and all above ground and underground utility structures, equipment systems and other infrastructure. "Independent Consideration" has the meaning set forth in the preamble. "Intangible Property" means all Permits and other intangible property or any interest therein now or on the Closing Date owned or held by Seller in connection with the Land and/or the Improvements, or with the use thereof, including trade names, water rights and reservations, zoning rights, business licenses and warranties (including those relating to construction or fabrication) related to the Land, the Improvements, or any part thereof; provided, however, "Intangible Property" shall not include the general corporate trademarks, service marks, logos or insignia or books and records of Seller, and accounts receivable. "Land" shall mean the real property described Exhibit A hereto. "Laws" means all federal, state and local laws, moratoria, initiatives, referenda, ordinances, rules, regulations, standards, orders and other governmental requirements, including, without limitation, those relating to the environment, zoning, land use, planning, health and safety, disabled or handicapped persons. "New Hospital Master Lease" shall mean the Master Lease Agreement entered into between Purchaser, as landlord, and Hospital Tenant, as tenant, on the Effective Date for the lease of the Hospital and related Improvements from and after the Closing, the performance of which by each party is contingent only upon the occurrence of the Closing. "Objection Notice" shall have the meaning ascribed to such term in Section 4.2 below. 4.2 Due Diligence Review. During the Due Diligence Period, Purchaser shall be entitled to review the Due Diligence Materials, and to examine, inspect and investigate the Property to determine whether it is acceptable to Purchaser. Seller shall grant Purchaser and those acting by, through, or under Purchaser full and complete access to the books and records of Seller with respect to the Property, and, provided the Closing occurs, permit Purchaser to retain copies of such books records. Purchaser and those acting by, through, and under Purchaser, shall be entitled to make all inspections or investigations desired by Purchaser with respect to the Property and shall have complete physical access thereto, provided (1) Purchaser and those acting by, through, and under Purchaser shall schedule any visits to, and inspections of, the Property at least one day in advance with Seller, and (2) such access shall not unreasonably interfere with Hospital Tenant's operations at the Property. If Purchaser shall, for any reason in Purchaser’s sole discretion, disapprove or be dissatisfied with any aspect of such information, or the Property, then Purchaser shall be entitled to terminate this Agreement by delivering a Termination Notice (herein so called) to Seller at or before 5:00 p.m. EST on the last day of the Due Diligence Period. If Purchaser’s written termination is timely made, then the Earnest Money shall be immediately returned to Purchaser and thereafter neither Party shall have any further obligations or liabilities to the other hereunder. If Purchaser fails to timely deliver the Termination Notice, then, except as otherwise provided herein, the Earnest Money shall thereafter be non-refundable, but shall be credited to the Purchase Price at Closing, and Purchaser’s right to terminate this Agreement pursuant to this Section 4.2 shall be of no further force or effect. 4.3 Permitted Exceptions. The term "Permitted Exceptions" shall mean: (A) the matters shown as exceptions in the Title Commitment as of the expiration of the Due Diligence Period and not objected to by Purchaser as described above, or that Purchaser has otherwise agreed to accept; (B) those items shown on the Survey as of the expiration of the Due Diligence Period and not objected to by Purchaser as described above, or that Purchaser has otherwise agreed to accept; (C) Laws existing with respect to the Property; (E) real estate taxes and assessments for the current and future years, which are not yet due and payable with respect to the Property or any portion thereof, and (F) the New Hospital Master Lease. The term "Permitted Exceptions" shall expressly not include any of the so-called "standard exceptions" or "pre-printed" exceptions which are subject to deletion by the Title Company upon receipt of a standard owner’s affidavit, which Seller shall provide at Closing (the "Affidavit"). Without limiting the foregoing, the Affidavit shall be in such a form so as to, among other things, cause the Title Company to omit from the Title Policy all exceptions for unfiled mechanic’s, materialmen’s or similar liens and to provide "gap" coverage insuring the period from the effective date of the Title Commitment through the date and time of recording of the Deed.